Our first project is to create a series of Green Roofs in Herne Hill, South London. 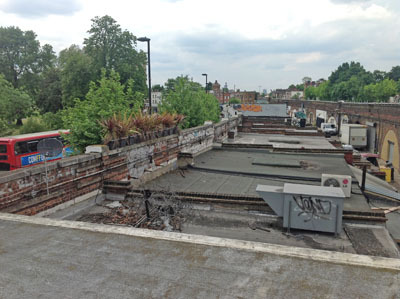 We are planning to install approximately thirty Green Roofs on premises in Herne Hill. These will be on the shops along Norwood Road and Railton Road. A project on this scale can make a real difference to our local air quality, help combat rises in temperature, absorb storm water run off, reducing flooding in the area, and provide places for wildlife such as bees, butterflies and and beetles to live, feed and nest. 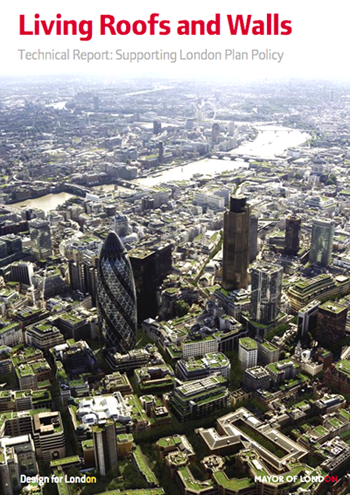 Their impact has been recognised in The London Plan which sets out a clear case for urban greening. we are working with shop owners, freeholders, local community groups, volunteers, council members, artists, surveyors, research students, biodiversity and sustainability experts and the President of The European Federation of Green Roof Associations and author of the UK code of conduct for Green Roofs. The project has already begun, a selection of roofs are about to be surveyed and we hope that the first Green Roof will be installed by the end of the year. Roofs will be incrementally installed as funding becomes available. A green roof is a deliberately vegetated roof. There are many different kinds now in the UK and some need more looking after than others. Green roofs are a very old form of vernacular building. Old buildings, as well as some new ones in Scandinavia have sod roofs and many old cottages in Scotland had turf roofs for warmth. What kind of plants grow on roofs? Extensive Roofs are planted with pre-grown sedum. The roofs we are planning to lay in Herne Hill will be growing sedum, which is a low, slow growing succulent. Sedum withstand dry conditions and require very little maintenance, but are great at absorbing water when it rains. Sedum is an Alpine plant and there are 400 varieties world wide, with about 25 naturalised in the UK which you may know as Stonecrop. What other kinds of Green Roofs are there? The roof on Derry & Tom's in Kensington (pictured above) is an example of an intensive green roof. These can be planted with wildflowers, shrubs and even trees, where the weight of the roof can support a lot of soil. They require a lot of maintenance and can be used to grow flowers, herbs and vegetables. Brown Roofs are sown with British Native wildflowers, chosen to cope with the kind of wet and dry conditions found on roofs. These are the most recommended for biodiversity. The flowers attract a lot of wildlife and bees. How do you lay a green roof? The sedum plants are pre-grown on mats, lifted onto the roof in large rolls and laid out. This should not take more than a day or two, depending on the size of the roof. Why put plants on a roof? Help to cool the whole city by reducing the Urban Heat Island Effect (UHIE) which is the tendency for a city or town to remain warmer than its surroundings. Sounds too good to be true? Researchers have been working for many years to produce evidence that green roofs do all these things very well. What kind of wildlife will be attracted? The roofs will attract birds and all kinds of invertebrates including bees. As bee populations are dwindling, they need all the help they can get. Will the pollen make my allergies (hay fever) worse? Sedum does not produce pollen. Even if the roof grows other flowers, the increase will be minimal. Most of people's allergies are caused by grass and tree pollen. Will the plants make my asthma worse? Research shows that the plants grown on a green roof filter particulates from the air. This means that green roofs improve air quality, and this is good for everyone. I want a green roof too! You can green any flat roof –on a conservatory, garage or garden shed. But you need a surveyor to verify that the roof can support the weight. It is also advisable to have a professional lay your green roof as they are trained to lay the waterproofing layer expertly. Roll over the picture above to see an artists view of the proposed green roof. Short film detailingt he development of the Railton Road / Norwood Road, SE24 Project.